A significant proportion of severe, inherited congenital muscular dystrophies are due to aberrant glycosylation of the extracellular matrix receptor α-dystroglycan and a consequent lack of ligand-binding activity. A key member of this glycosylation pathway is the LARGE protein, which was originally identified through genome sequencing and genetic studies. Until recently, the biochemical activity of this enzyme proved frustratingly elusive, but a recent study shows that LARGE encodes a bifunctional glycosyltransferase that synthesizes a novel polysaccharide structure, which is required for functional dystroglycan. Identification of this structure should lead to development of new diagnostic tools and therapeutic strategies for these dystrophies. Advances in genome sequencing and bioinformatics have led to the identification of hundreds of genes of unknown or only inferred function. Often, the first insights into the function of a gene come from identification of mutations associated with a human disease and the task is then to determine the underlying molecular pathways in which the gene is involved. This may be challenging and could require a combination of in vivo, cellular and biochemical experiments to provide the answer. In the fields of glycobiology and medicine, determination of the enzymatic activity of LARGE, a putative bifunctional glycosyltransferase, has been the focus of a great deal of recent interest because of its association with congenital muscular dystrophy (CMD). CMDs are a group of clinically and genetically heterogeneous disorders that are currently untreatable. These diseases are usually severe and often involve other organs, particularly the central nervous system . The genetic basis of a significant proportion of CMDs is still unknown; further understanding of the molecular pathways already identified may help to find these missing gene loci and aid both diagnosis and the development of therapeutic strategies. Around 10 years ago, through positional cloning of the mouse myodystrophy (myd) mutation, the LARGE gene was shown to be necessary for the functional glycosylation of the extracellular matrix receptor α-dystroglycan  and to be required for ligand binding by this receptor . Subsequently, from their association with human muscular dystrophies, a number of additional genes were identified within the same glycosylation pathway . These disorders are all associated with hypoglycosylation of α-dystroglycan and thus are collectively termed dystroglycanopathies. The medical relevance of dystroglycan glycosylation is not restricted to the muscular dystrophy field; arenaviruses, which can cause severe disease in humans, use the same glycan structures to bind α-dystroglycan as a co-receptor , and many epithelial cancers lose α-dystroglycan glycosylation, in some cases because of silencing of LARGE . The role of LARGE in the dystroglycan glycosylation pathway has been of particular interest; circumstantial evidence suggested that it synthesizes a novel glycan structure that is directly responsible for ligand interaction. Uniquely, overexpression of LARGE rescues functional glycosylation of α-dystroglycan in cells defective for other enzyme components of this pathway . However, although it became clear that unusual O-mannosyl glycans on dystroglycan are required for ligand binding , the biochemical activity of LARGE remained frustratingly elusive until a recent publication in Science . Dystroglycan is a widely expressed protein with roles in muscle stabilization, cell migration, basement membrane assembly and signaling . In skeletal muscle, dystroglycan links dystrophin and the actin cytoskeleton inside the cell to the extracellular matrix (ECM) through laminin. The protein is synthesized as a precursor molecule that is post-translationally cleaved into α and β subunits. The extracellular α subunit is extensively glycosylated with O-linked glycans that include unusual O-mannose and O-phosphomannose structures [6, 8]. Although these mannose structures were shown to be necessary for ligand binding in vivo, the precise structure of the glycans involved in the ECM interaction remained unclear. The severity of the dystroglycanopathies varies from Walker-Warburg syndrome, a severe form of CMD that is also associated with ocular abnormalities and CNS defects, to milder forms of limb girdle muscular dystrophy with no CNS involvement . The severity of the clinical phenotype does not correlate with the particular gene mutated but probably relates to the pathogenicity of the specific mutations and the extent of the loss of α-dystroglycan glycosylation. LARGE is one of at least six dystroglycanopathy genes, along with POMT1, POMT2, POMGnT1, Fukutin and FKRP ; several of these genes encode enzymes that are known to be directly involved in synthesis of O-linked mannose structures (Figure 1). Key glycans on α-dystroglycan. Dystroglycan contains unusual O-mannosyl glycans that are necessary for ligand binding activity. (a) Two structures that have been implicated in ligand binding by genetic and biochemical studies. Proteins mutated in dystroglycanopathies are shown in red boxes, and their enzyme activities, where known, are indicated by arrows. POMT1 and POMT2 encode protein O-mannosyltransferases. Although this glycan was originally considered a candidate for the laminin-binding moiety (and mutation of POMT1, POMT2 or POMGnT1 results in dystroglycanopathy), enzymatic removal does not destroy the laminin-binding activity in vitro . The recently described phosphomannose structure  contains an unknown structure (X) thought to be the glycan responsible for binding. LARGE and Fukutin (and probably FKRP) act downstream of the formation of this structure. Gal, galactose; GlcNAc, N-acetylglucosamine; Man, mannose; P, phosphorylation; Sia, sialic acid. (b) LARGE synthesizes a polysaccharide with repeating units of [Xyl(α1→3)GlcA(β1→3)] that is required for ligand-binding activity (star, xylose; diamond, GlcA). This structure is a good candidate for the X moiety attached to the phosphomannose in (a). The functions of Fukutin and FRKP and their relationship to the synthesis of this structure are currently unknown. Initially, biochemical and genetic studies pointed towards an O-mannose tetrasaccharide as a likely candidate for the laminin interaction (Figure 1). However, enzymatic removal of most of this structure does not eliminate laminin binding . Further biochemical and mass spectroscopy studies identified a phosphomannose structure on dystroglycan  and showed that LARGE and Fukutin (and probably FKRP) act downstream of formation of this structure (Figure 1). Thus, the ligand-binding structure is thought to be synthesized, at least in part, by LARGE and is presumed to be attached to this phosphate. LARGE was first identified by bioinformatic analysis of the human genome sequence. The name LARGE derives from the fact that this gene, at 650 kb, is one of the biggest in the human genome, even though the coding region covers only 2 kb. The protein contains two predicted catalytic domains, each showing homology to a different family of glycosyltransferases, suggesting that LARGE is a bifunctional enzyme . However, the enzyme activity of LARGE proved difficult to elucidate from sequence homologies alone. Kevin Campbell and colleagues  have now shown that LARGE indeed encodes a bifunctional glycosyltransferase that has both xylosyltransferase and glucuronyltransferase activities. In this study, the authors  performed compositional analysis of the sugars present on α-dystroglycan expressed as a secreted, recombinant protein by human embryonic kidney (HEK293) cells. In addition to the expected components of the known O-glycans identified by previous studies, they identified significant amounts of two unexpected sugars - glucuronic acid (GlcA) and xylose. Furthermore, a Chinese hamster ovary (CHO) cell line defective in synthesis of UDP-xylose did not show increased immunoreactivity with the monoclonal antibody IIH6, which recognizes fully glycosylated dystroglycan, when transfected with LARGE, in contrast to UDP-xylose producing cell lines . Although both GlcA and xylose are components of some glycosaminoglycan (GAG) chains , previous studies had indicated that GAGs were not necessary for α-dystroglycan binding to laminin. 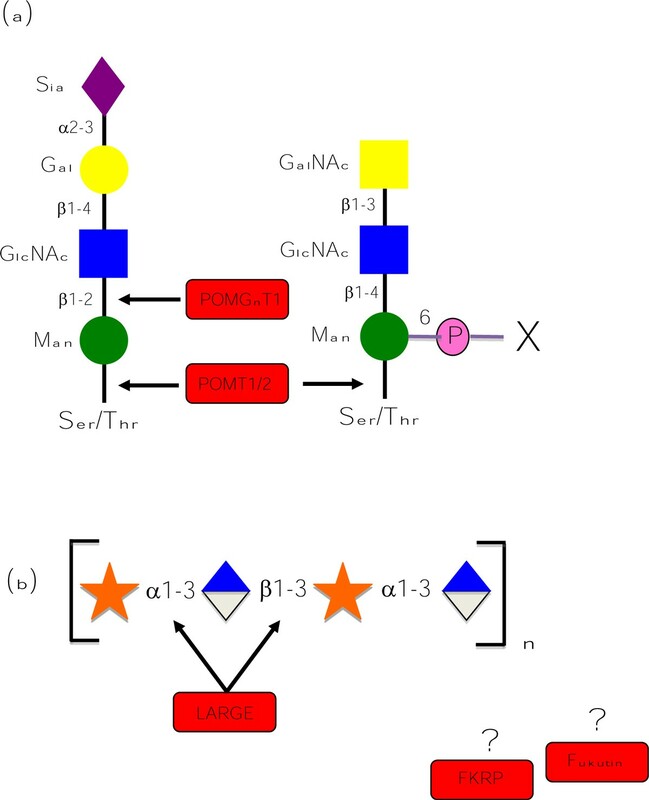 Hypothesizing that LARGE has both xylosyltransferase and glucuronyltransferase activities and might synthesize a repeating disaccharide, Inamori et al. tested the ability of purified LARGE to use artificial xylose and glucuronide acceptors and different UDP-sugar donors. This demonstrated that LARGE has both glucuronyltransferase and xylotransferase activity. Many glycosyltransferase domains (including both of those within LARGE) contain conserved DXD amino acid motifs. Mutation of these motifs had previously been shown to ablate the activity of exogenously expressed LARGE. Here, mutation of this motif in each domain separately was used to identify which is responsible for each of the observed enzyme activities . Further enzymatic analysis combined with mass spectroscopy analysis of the products confirmed that LARGE is a polymerizing enzyme that produces a polysaccharide with repeating units of [Xyl(α1→3)GlcA(β1→3)]. Although xylose is present in many types of GAG, it is used as an initiator of chain synthesis, rather than being part of the repeating unit . Thus, LARGE synthesizes a previously unreported GAG-like polymer that probably represents the ligand-binding moiety of α-dystroglycan. Although it is logical to suppose that this polysaccharide chain is attached to the phosphomannose structure (identified by the same group two years ago), no evidence is presented in this paper  to support this hypothesis. The work of Inamori et al. represents a significant breakthrough in this field and provides a clear example of the medical importance of variation in the glycome. The involvement of other proteins that are known to be required for correct α-dystroglycan (such as Fukutin and FKRP) in the formation of this polymer can now be examined more readily. The extent of α-dystroglycan glycosylation varies widely between different tissues  and the length and/or number of [Xyl(α1→3)GlcA(β1→3)] polymers could contribute to this (and perhaps also to variation in the clinical phenotype of dystroglycanopathy). It is unclear whether the polymer is modified in vivo, but this seems likely and could also contribute to heterogeneity; many GAG chains are extensively modified following synthesis . This study also has important clinical implications. There is a need for better diagnostic tools for the dystroglycanopathies; identification of the GAG-like structure should help to generate more reliable or specific antibodies, for example. Little is known about the dystroglycan-ligand interaction, but now it will be possible to directly study the glycan-laminin interaction. Furthermore, as LARGE is already regarded as a potential general therapeutic target for dystroglycanopathy , by determining the biochemical actions of the protein, the work of Inamori et al. will facilitate the search for pharmacological interventions that augment LARGE glycosyltransferase activity and could be used as treatment for these diseases. The author acknowledges funding for dystroglycan research from the MDA, USA, The Wellcome Trust and the BBSRC.